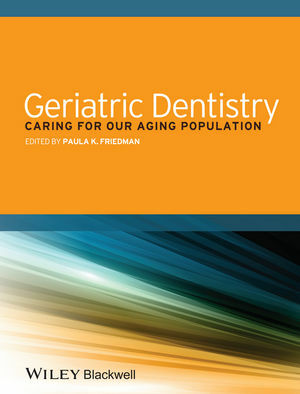 Geriatric Dentistry: Caring for Our Aging Population provides general practitioners, dental students, and auxiliary members of the dental team with a comprehensive, practical guide to oral healthcare for the aging population. Beginning with fundamental chapters on the psychological, environmental, and social aspects of aging, the book approaches patient care from a holistic point of view. Subsequent chapters show the importance of this information in a practical context by discussing how it affects office environment, decision?-making and treatment planning, and the management and treatment of common geriatric oral conditions. Case studies and study questions are used to illustrate application of educational presentations to practice settings. Contributed by leaders in the field, Geriatric Dentistry will strengthen readers’ understanding and clinical acumen in addressing this special population. Paula K. Friedman, DDS, CAGS, MSD, MPH, is a Professor and the Director of the Geriatrics and Gerontology Section in the Department of General Dentistry at the Boston University Goldman School of Dental Medicine. She also directs the Geriatric Dentistry Fellowship Program. Dr. Friedman has served as President of the American Society of Geriatric Dentistry, the American Dental Education Association, and the Massachusetts Dental Society. Her research interests include quality of life, interprofessional education, and long-term care environments.